Click on Add button from the top left corner of your screen and choose Person option. A window will pop up where you can enter all details of the person. Select the checkbox Add another person if you want to add another person to the account, and enter the details, just like you did for the first person. You can also click on More details to add further details like password, language, title and timezone of a person. Hit Add button and the person will be added. 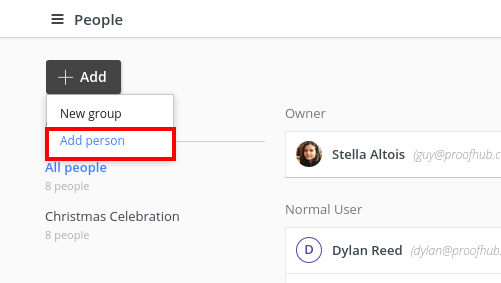 While adding any person, you can skip More details section as it is optional. In it in case you do not mention a person’s password then the person added, will get an email notification with his or her email id along with a link to generate a password for their account. And, if you mention the person’s password then he or she will receive an email notification with their email id and password in it. 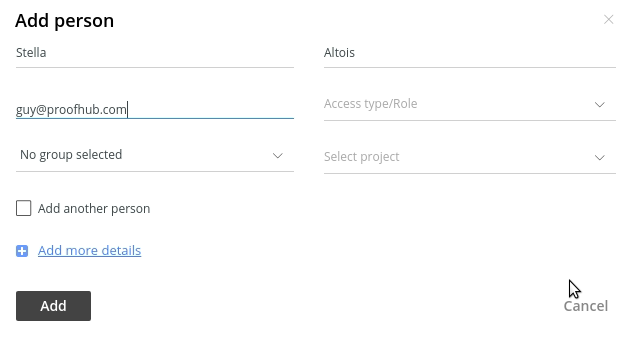 While choosing any access type/role for users, you get the option of Manage roles from where you can create a new role for users to define their access levels or permissions for each section of ProofHub.